Wales has been a part of my life for as long as I can remember, from visits to relatives and long school holidays to eventually spending a few years living there myself. I love returning to the country as often as possible and I'm always surprised when I meet those rare poor souls who are yet to visit. My favourite area of Wales is the west. Travelling north from Cardigan to Machynlleth I've explored a good proportion of the beaches, countryside, towns and villages and when visiting Aberystwyth it feels like I'm going home. Given it's more than a decade since I've lived there it's probably time I mentally moved on. All this love means I'm a bit of a menace if you happen to be in the area with me. I'll try to drag you to all my favourite haunts, share hundreds of memories of visits and insist you come along to my favourite cafe or pub. In the past I'd also have dragged you into my favourite bookshop but nowadays lots of those places have closed so I can only talk about the gems people are missing out on. However, as times change new attractions are also opening. 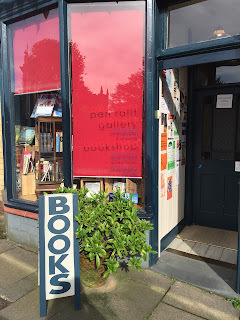 Pen'rallt Gallery Bookshop in Machynlleth didn't exist in my day, but had the bookshop been born it would certainly have been one of my reasons for visiting the town. 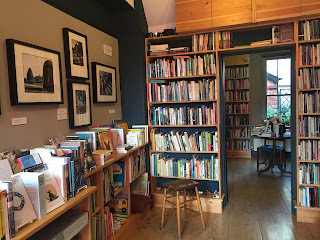 I discovered this bookshop, which has actually been around for many years, during a recent tour of the area as part of my annual Rail Ale Trail. The visit was late in the day, but lots of train travel and my decision to skip a pub to visit mean sobriety was not an issue here. It also gave my friends a few minutes of peace from an over-enthusiastic me telling them how much I like the town's clock tower/pub/hippie shop/famous residents. The bookshop is a series of small rooms, with smart shelves of new and secondhand books in English and Welsh sitting side-by-side. Above these at the time of my visit, a striking black and white photography display contrasted with all the colourful spines and lived up to the gallery part of the bookshop's name. And as I entered the bookshop this was all perfectly illuminated by sunshine streaming through the window, and the smile of the friendly bookseller. She welcomed me in, gave a brief but helpful explanation of the layout of the bookshop and then left me to enjoy my surroundings. It was a welcome moment of calm in between the excitement of my travels and I enjoyed familiarising myself with the selections and working out the not-quite-straightforward-but-actually-very-sensible arrangement of different combinations of fiction – if you're wondering what I'm on about you'll have to travel over for a visit, I can't give everything away in this blog. 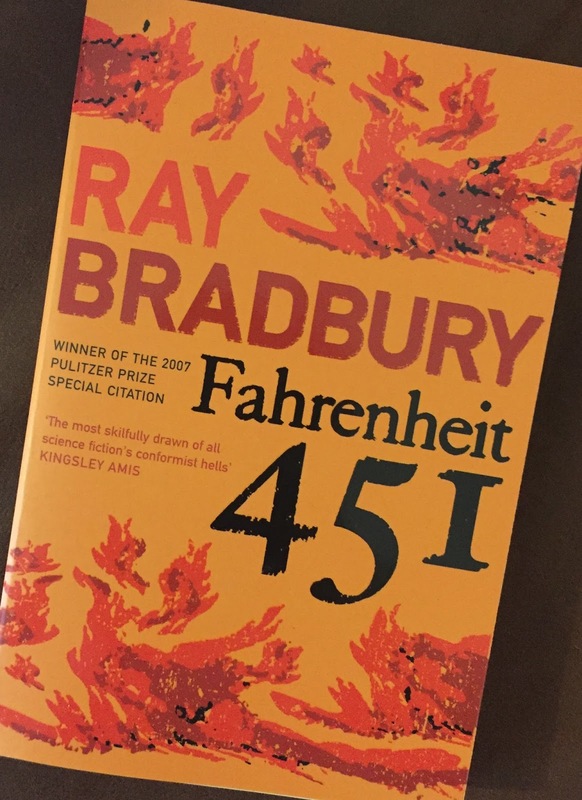 My purchase was Ray Bradbury's Farenheit 451, not the most obvious choice in such a calming place but for me it's a good reminder of the diversity of Pen'rallt Gallery Bookshop's stock. Machynlleth's not somewhere many people can pronounce* and as far as I'm aware – beyond the Centre for Alternative Technology and miles of beautiful but slightly rainy countryside – it doesn't have a big tourist industry so I'm guessing visitors are few and far between. But in my eyes these are perfect reasons to visit, especially when that train line makes access so easy. 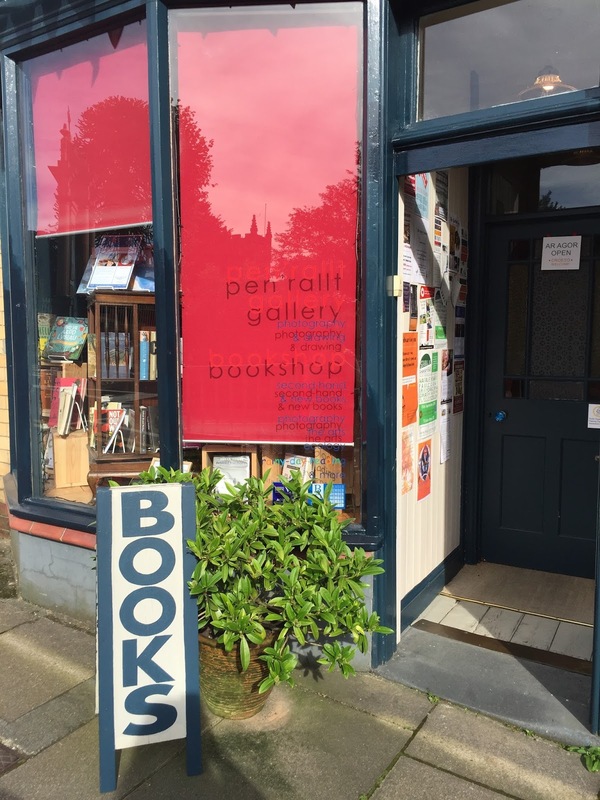 Then, once you arrive in the town but want a rest from all the fresh air and countryside, pop along to Pen'rallt Gallery Bookshop and find a book to curl up with, preferably in one of the local pubs. *Try mak-un-cleth, although many of us get around the risk of ruining the name by simply calling it Mach.